The Startup Nation and Smart Nation just became that much closer. Earlier today, OurCrowd announced that it has closed a strategic partnership agreement with United Overseas Bank Limited (UOB), headquartered in Singapore. This collaboration is OurCrowd’s first official foray into Asia and represents a significant step towards developing the FinTech ecosystem in the region. OurCrowd, together with UOB and with the support and investment of the Sassoon Investment Corporation, an investment holding company with deep roots in Asia, is working to bring equity crowdfunding to Singapore and beyond – offering a new asset class to accredited investors in the region of Asia. The partnership pairs UOB’s strengths and depth of experience in serving entrepreneurs as well as small-and medium-sized enterprises (SMEs) across the region with OurCrowd’s expertise in investing in some of the world’s most promising startups via equity crowdfunding. This is an important announcement for OurCrowd but it’s equally important for our investors. Through this collaboration, OurCrowd’s global investor community will be able to invest in innovative Asian companies with differentiated and highly scalable products, who in turn will now get access to another source of funding through OurCrowd’s equity crowdfunding platform. This isn’t the first time OurCrowd has partnered with prominent venture capitalists and corporations. Since its launch in 2013, OurCrowd has co-invested alongside major firms, such as Sequoia, Accel Partners, Index, Microsoft, GE, Intel, and 3M, as well as with several prominent angel investors such as Vinod Khosla, Mark Benioff, Eric Schmidt, and others. Read the full press release here. 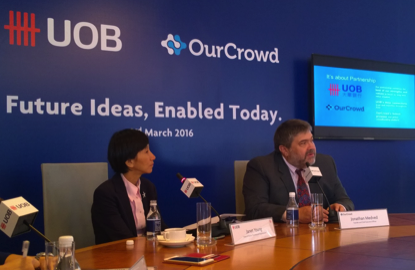 Learn more about the UOB-OurCrowd partnership here.